Investment Strategies | Confident. Returns. - Part 2 Investment Strategies – Page 2 – Confident. Returns. This post kicks off a series that delves into an important debate unfolding in the finance community – is there an art to investing or is there a science to investing? Often times, this leads to a lot of other debates such as the active versus passive investment debate. It should come as no surprise, that we believe in both. There is a role for art in investing and that it works in tandem with the science of investing. Many years ago economists developed mathematical models to optimize investing. Sounds simple. But is it really in a world of changing rules, unexpected events, and evolving individual needs? The following series explores why investing is more than math and why a constantly changing macro-environment and evolving personal circumstances demand a human touch that is set apart from mechanical empiricism. Our belief is that investing is an art not just a mathematical science. The following series starts with the world as it currently is and, hopefully before the series ends, will enhance the investor’s ability to successfully cope with investing. Defining one’s goals isn’t easy for some people. Trying to envision what your life will look like at some point in the future can be difficult. There are so many emotional and financial variables and so many unknowns in life that it can leave you feeling stuck or in a holding pattern until you find clarity. We know that because it is a relatively common issue that we run into with our clients and an issue we try to help resolve for them. Retirements, illness, or the death of a family member can be very disruptive. We help clients find clarity by trying to quantify the financial impacts of their situation and model other scenarios they are considering. To illustrate what we do, let’s consider a typical client situation. A couple with two college-age children have come to us looking for guidance in planning for their future. They have very good incomes and a vacation property, but there expenses are high and they have not saved as much as they should have in the past. We model their current financial situation and extrapolate those results out through their retirement. Every conceivable financial variable is used to model the current situation: income expenses, accounts, assets, social security, etc. The result is some perspective on the likelihood of maintaining the current lifestyle assuming nothing changes. The model is summarized in a simple graphic, an example of which is below. 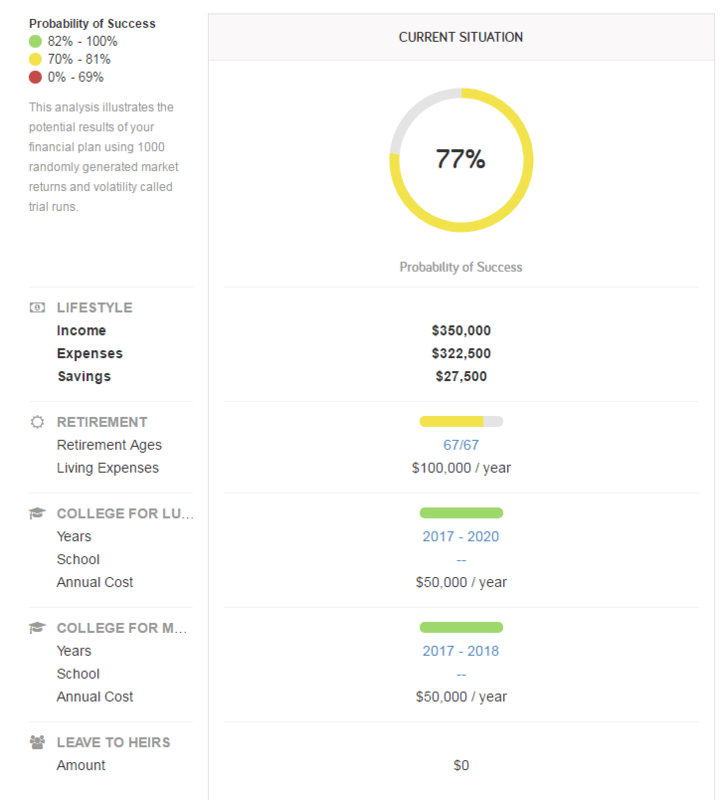 In the first example above, it shows that their annual savings of $27,500 is used to successfully fund college education for two children as evident by the two green bars. But it comes at an expense -their retirement is not fully funded as seen by the yellow bar. This is where the conversation begins. Then we can see how that change will affect the probability of success. We can see below that by making this one change, we have increased the probability of success from 77% to 93%. Sometimes, this gives the client enough clarity to make a decision and move on. But that’s not always the case. After the client has thought about making a major decision (such as selling a vacation home), they may come back saying they can not actually sell their vacation property and need to consider other options. 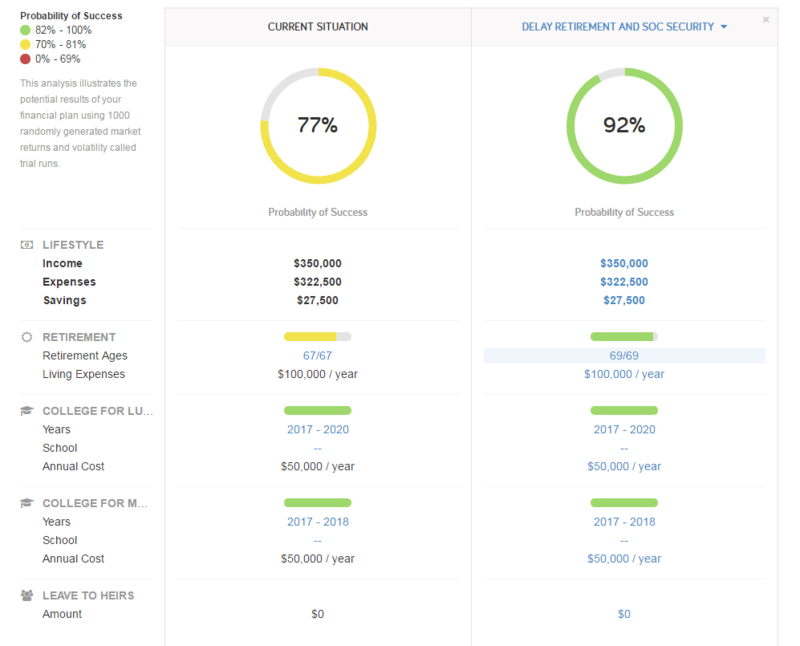 Below is a comparison of their current situation compared to a scenario in which they delay retirement for two more years. The result is almost the same as if they sold the vacation property. After this exercise, the client has two viable options to consider to get them on track for retirement. By seeing certain scenarios modeled, it can make possible decision more real to them and hopefully more achievable. The illustration we provide help them make better decisions. There are lots of emotional decisions that revolve around major life decisions, like retiring, changing jobs/careers, and moving. We believe that by addressing the financial impacts of these decisions, we can affect the emotional considerations that may be holding our clients back. Our goal is to provide that nudge to get them moving in the right direction and to keep them from making mistakes. Here is an interesting chart I came across that shows just how volatile the stock market can be during the year. In a year where we have seen relatively little downside volatility in the market, it’s important to remember that there can be some big and sometimes scary corrections in the market. 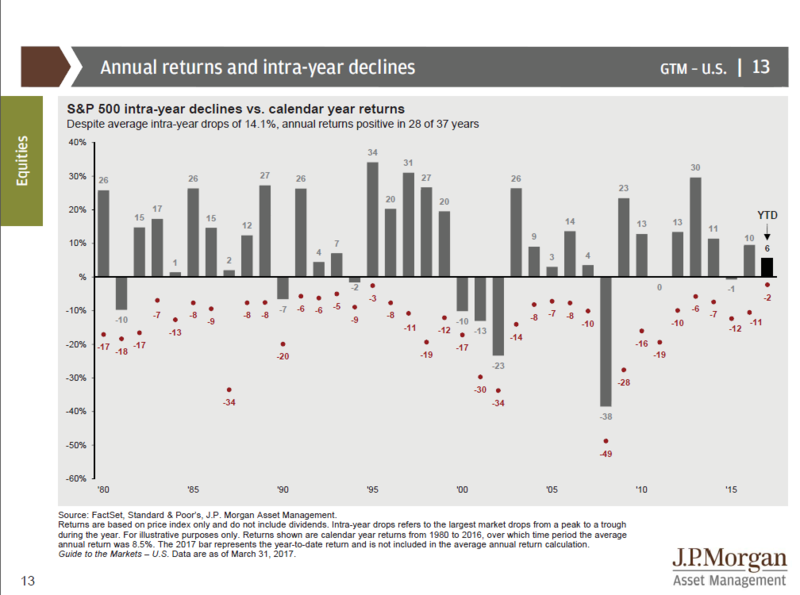 This chart shows the calendar year returns in grey bars for the S&P 500. But the interesting take away are the red dots that show the intro-year decline of the index. Look at 2016, which ended the year up 10%, but was down as much as 11%. Those “shocking” market corrections and big declines that lead investors to make bad decisions are not unusual. They are just really scary when we are in the midst of a correction. In the last 10 years, the rise of target funds have become common options found in 401(k) plans. While many love the simplicity of the fund options, investors are giving up a lot of control. And in some cases, they do not even know what they own. That is setting many investors up for a potentially big surprise later in life. The premise is simple: investors select from several different target date options based on the approximate date they expect to retire. For example, anyone who plans to retire in 25 years may select the 2040 target date fund or the 2045 target date fund as those are the closest options to his retirement date. As the years role by, the fund slowly migrates from an aggressive stock dominated plan to a mostly conservative bond portfolio by the time he retires. Some target date funds will continue to move to more conservative investments even after the target date has been reached. This can be a good default option for investors but investors shouldn’t rely on default options all the time. These funds don’t reflect an investors individual risk tolerance nor are they designed to fit into an investors overall financial plan. Let’s expand on our example from before: let’s say that 40 year old investor is averse to risk. 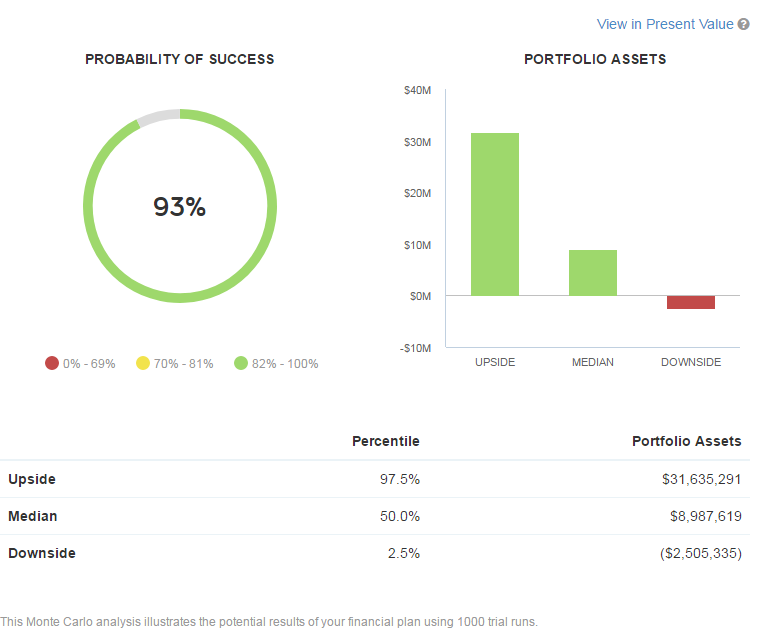 He may want a really conservative portfolio, but if he selects the 2040 target date fund, he will take on more risk than he may want if the portfolio was built just for him. Conversely, we see some clients that come to us the other way around. They have several other investment accounts in addition to the target date fund. When they eventually retire, the funds from their target date fund may not be used until much later in their retirement years. In that case, the fund will become too conservative too early which means the client might be missing out on market appreciation. Not all target date funds are created equal. We routinely see target date funds with some flaws in how they’re constructed. Their asset allocations, risk profile and glide path differ dramatically and as such the results and investor experience differ as well. 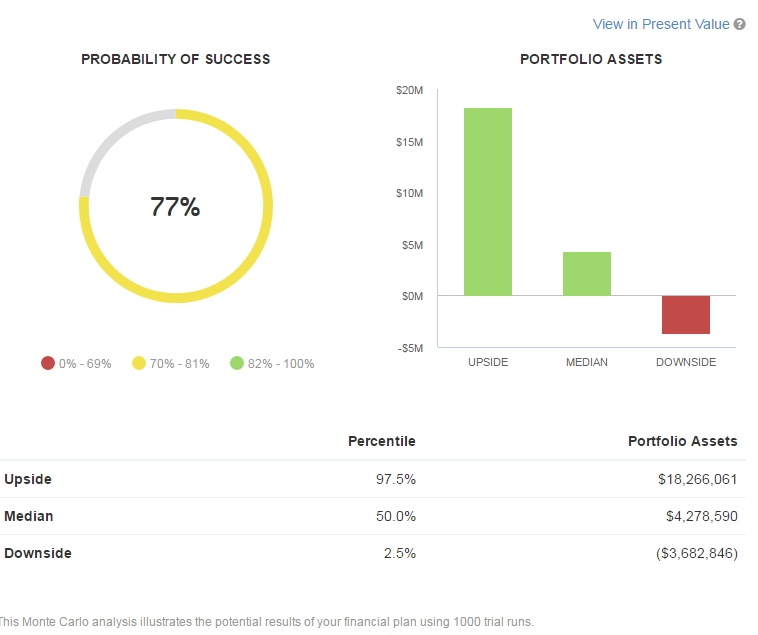 I’ve seen allocation to equites in 2025 target date funds range from 50% all the way up to 77%! That’s a huge difference. In some rare cases, we advise clients not to use the target date funds because the asset allocation is so bad or because the underlying investments are inappropriate. Target date funds are a default option – a starting point. That should not be confused with tailored investment strategy, custom planning or optimizing one’s financial situation. Stay the course. That’s the secret. The pain we experience when we see the account balance drop is much greater than the joy we feel when we see the account balance increase by the same amount. Imagine you have a retirement account with $500,000 in it and it declines by 20% to the end the month at $400,000. That can be scary – you’ll most likely question your allocation and investments. Unfortunately and in too many cases that is exactly what investors do: The sell out of their losers and buy something inappropriate for themselves. There are still many investors that are still sitting in cash after selling out of the stock market during the worst moments of the recession of 2008.